Fighting “radical Islamic terrorism” was high on President Donald Trump’s lengthy list of campaign promises. Consistent with Trump’s campaign rhetoric, the current administration continues to claim that violence perpetrated by Muslim extremists is unique and a uniquely dangerous threat. 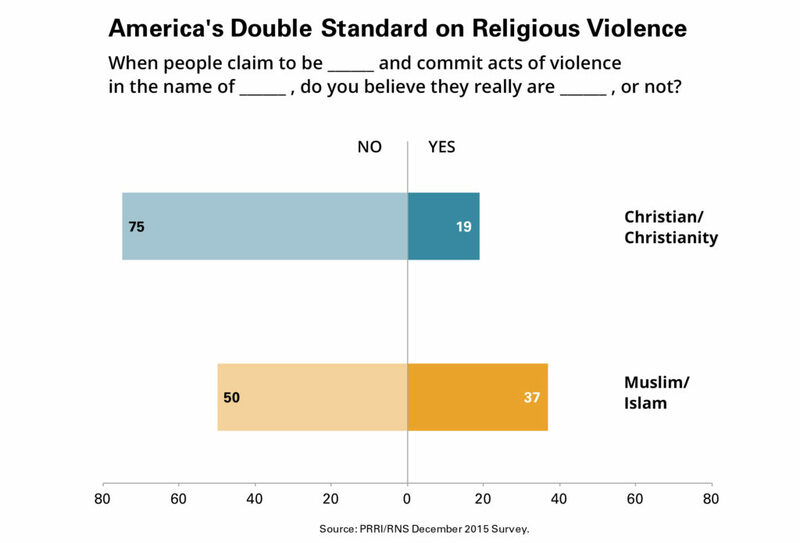 A recent PRRI survey shows that while Americans tend to employ a double standard when it comes to religious violence, relatively few believe that people who commit acts of violence in the name of Islam are truly Muslim. Three-quarters (75 percent) of the public say that self-described Christians who commit acts of violence in the name of Christianity aren’t really Christian, while half (50 percent) of the public say the same about people who claim to be Muslim and commit religiously-motivated violence. Fewer than four in ten (37 percent) say that such people are actually Muslim, while 13 percent are uncertain. While Americans of all stripes exhibit this double standard to some degree, there are notable partisan differences. A similar number of Republicans (75 percent), independents (72 percent) and Democrats (79 percent) believe that people who commit acts of violence in the name of Christianity are not really Christian. However, Republicans are far less likely to make these same allowances for Muslims. 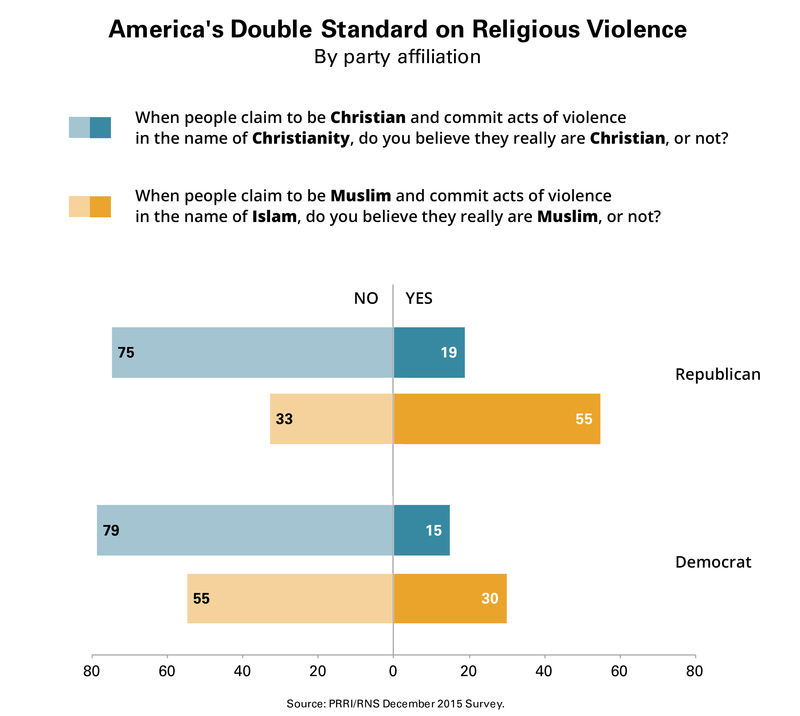 Only one-third (33 percent) of Republicans believe that people who commit acts of violence in the name of Islam are not actually Muslim. In contrast, a majority of Democrats (55 percent) and independents (53 percent) believe that those who claim to perpetrate acts of violence on behalf of Islam are not really Muslims. No religious group expresses a larger double standard than white evangelical Protestants. White evangelical Protestants are the most likely (87 percent) to disown Christian terrorists who claim to be acting in Christianity’s name. However, they are among the least likely (44 percent) to say the same about terrorists who say they’re Muslim. Other Christian groups also express a double standard, but it is notable that the gap is smaller than Americans overall. 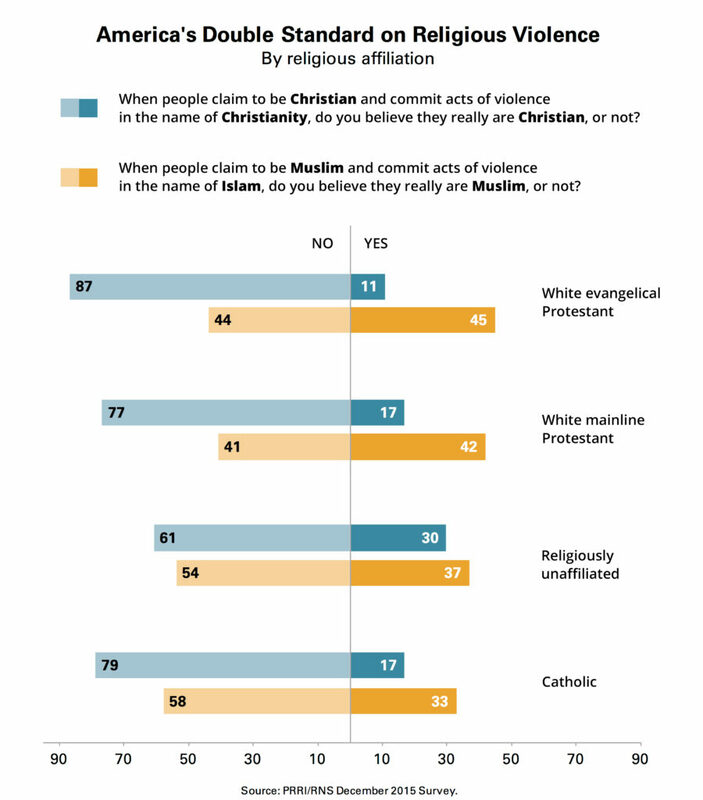 More than three-quarters (77 percent) of white mainline Protestants reject the idea that someone can be a legitimate Christian and commit terrorism in the name of religion; 41 percent reject the idea that true Muslims can commit religious violence. The double standard is more modest among Catholics—but still present. Seventy-nine percent of Catholics say individuals who commit violence in the name of Christianity are not Christian; 58 percent of Catholics say the same of Muslims. The religiously unaffiliated stand out as having the smallest double standard: 61 percent reject the idea that terrorists who claim to be acting on behalf of Christianity are legitimately Christian, and a majority (54 percent) say the same of people who say they’re acting on behalf of Islam. For more, read the PRRI/RNS December 2015 Survey.